My mother and maternal grandparents were thank God, able to survive the Holocaust. But the five years they lived in Germany under Nazi rule were horrendous. 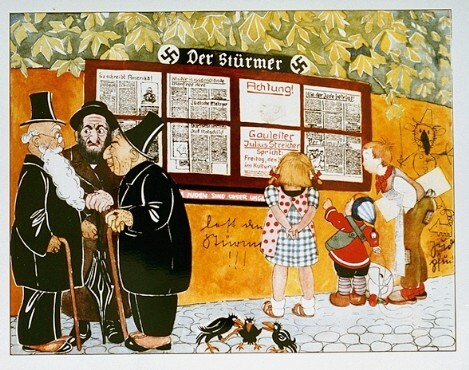 To this day, my mother can still vividly recall occasions upon which she and her parents returned to their home in Mannheim only to found their apartment down covered with hateful anti-Semitic cartoons and caricatures from German newspapers and magazines. Cultural anti-Semitism was not only acceptable, but expressing such hate openly was considered patriotic. At first glance, I wondered if the producers were pulling this shtick to show their victims the foolishness of prejudice. But it’s clear from the moment the producers of the show came clean with the first guest that they fooled that they find hating Jews just hysterical! How ’bout that? Chuckle-chuckle. Never mind what this video says about the producers of this Egyptian TV show, what does this video tell us about cultural anti-Semitism in Egypt and the Arab world? Is Arab hate for the Jewish people so profound that it is expressed without hesitation? Is their hate for Jewish people so ingrained that it can quickly and easily turn to violence as it did in this instance? The so-called “Arab Spring” is clearly not enlightening anyone to the foolishness of age-old prejudices. But then again, what do I know, I’m just lying Jew.